“Build the Wall” became a battle cry for supporters of President Trump in the last election. Trump and his supporters have been wrongly accused of racism and hatred but the issue for those accused is the rule of law. We want people to come to America…we want them to come legally! We abhor the drug and human trafficking and want it stopped. We want criminals prevented from crossing into America illegally to do their crimes. Republicans initially failed to include funding directed specifically to the Wall. But the latest omnibus bill did include a “$1.6 billion down payment” for the Wall. Congress still refuses to fund a complete border wall, but that isn’t stopping the king of construction, Donald J. Trump, from delivering the goods where it is needed most. The El Paso Times has provided an entertaining and interesting video of construction of a new, much bigger border wall being built on the border separating the metropolises of Juarez, Mexico and El Paso, Texas, with a combined metropolitan population of at least 2.7 million souls. In an environment of scarcity, priorities must always be established, and the most densely populated areas should pay the greatest dividends in limiting the prospects of border-jumpers. San Diego and Tijuana, along with El Paso and Juarez are ground zero. Lifson’s article references The Hill, the El Paso Times, and the New York Post. 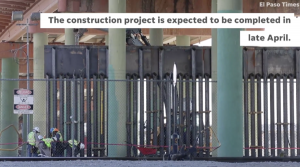 The El Paso Times has video of ongoing construction. This entry was posted in Border Security, Federal Budget, Foreign policy and affairs, Illegal immigration, Morals and Ethics. Bookmark the permalink. 2 Responses to THE WALL! Can’t remember who said it (might be old age) but it’s right on the money: Countries without borders do NOT have a country. J, It’s incredible that someone actually had to say it! That someone had to tells us how people unconsciously accept the open borders concept without giving any thought to the downside.